Pan-STARRS is short for, Panoramic Survey Telescope & Rapid Response System, which will be observing the outer Solar System and beyond. Pan-STARRS is a long name that describes a new telescope, which a prototype version, PS1 has started to survey the night sky. It is very unique in that it can look at, and photograph over 6,000 square degrees of the sky each night. To get a feel of how big that is, consider that the full Moon is .5° wide, and it covers about .2 square degrees, so 6000 deg2 is a very large area of the night sky. 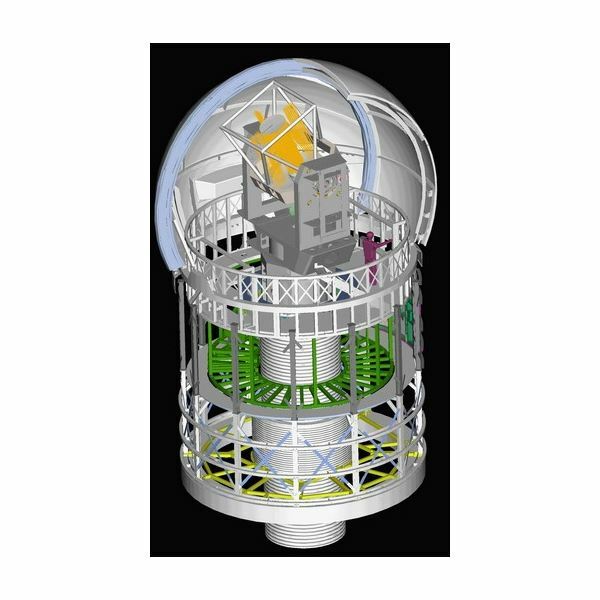 The telescope has a 3° field of view and will take an image about every thirty seconds covering 7 square degrees. Over the course of an 8 hour night it will be able to image about 6000 deg2. As a picture is worth a thousand words, take a look at the images below which show the relative field of view of Pan-STARRS compared to Hubble (.05°), the eight meter Subaru telescope (.5°) and the Palomar sky survey that was conducted in 1950 using a 1.2 meter telescope with a 6° field of view. 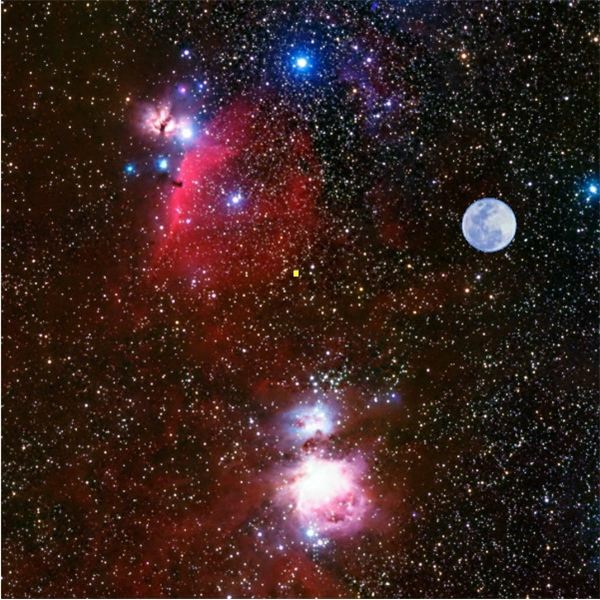 The background is a 6° field of the Orion nebula and the full Moon is to scale. Note that Pan-STARRS is about 400 times more sensitive than the telescope used in the Palomar survey. It will be able to see down to a magnitude of 24 and should be able to reach down to a magnitude of 29.4 by averaging images that have been taken over several years. The resolution of the telescope is about .07 arc seconds, making it great for astrometry. 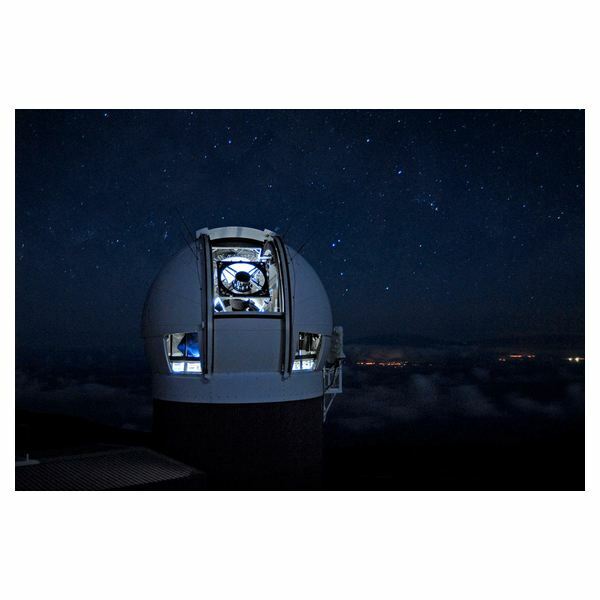 Pan-STARRS has started operation with PS1 on Haleakala, Maui, a prototype of the PS4 telescope, which will be four times as powerful as PS1 and will be located on Mauna Kea in Hawaii. Joining the soon to be built Thirty Meter Telescope. PS1 has a 1.8 meter diameter primary mirror and a state of the art CCD camera that consists of a 64 x 64 array with 600 x 600 pixels each, giving a total of 1.4 gigapixels, a bit more than your average digital camera! Each night of observation will create about four terabytes of data (equivalent to about 1000 DVDs) that will be analyzed by computer for objects—especially dim ones—that have changed position from previous observations indicating the presence of an asteroid or comet moving within the Solar System. Over the course of 3 years it is expected that PS1 will catalog over 5 billion stars, 500 million galaxies and about 100,000 asteroids. Just wait for PS4 to start operation! One of Pan-STARRS’ main tasks is to identify and track near Earth objects or NEOs. These objects are of great concern, as they may cross Earth’s orbit sometime in the future, and if we happen to be in the right place at the wrong time we could all have a very bad day! It has happened before and will happen again. But, by knowing where these objects are, and what their orbital parameters are, we can predict when they may become a threat. If these nomads of the Solar System are identified early enough, we may be able to deflect them in some fashion to avert a collision. While Pan-STARRS is looking for NEOs it will also be doing astronomical research in other areas of our Solar System including the Kuiper Belt and far beyond as it searches for exoplanets and explores our local neighborhood for low luminosity stars such as red and brown dwarfs. It will also push beyond our Milky Way galaxy and explore distant galaxies to study galaxy clustering, and look for dark matter as it advances the science of cosmology. 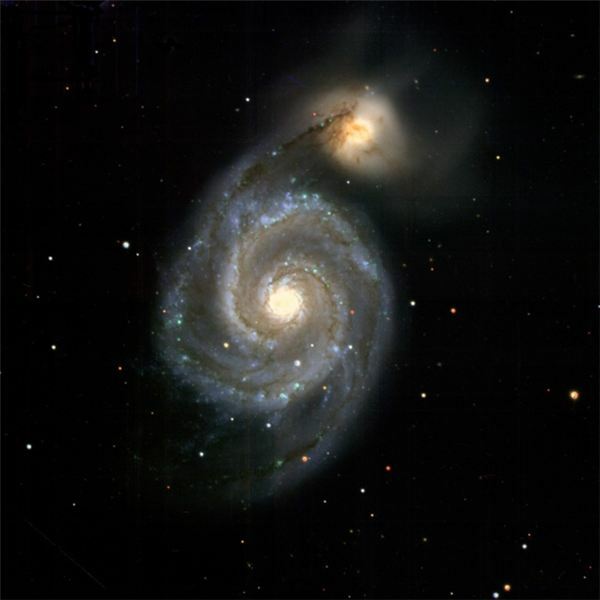 All images are courtesy of the Institute for Astronomy at the University of Hawaii. Further information about Pan-STARRS and its mission can be found on the links below.